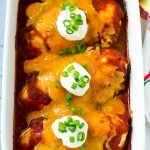 This salsa chicken is chicken breasts coated in taco seasoning, salsa and cheese, then baked to perfection. A quick and easy meal that the whole family is sure to love. When I’m looking for dinner in a hurry, I often turned to baked chicken dishes. 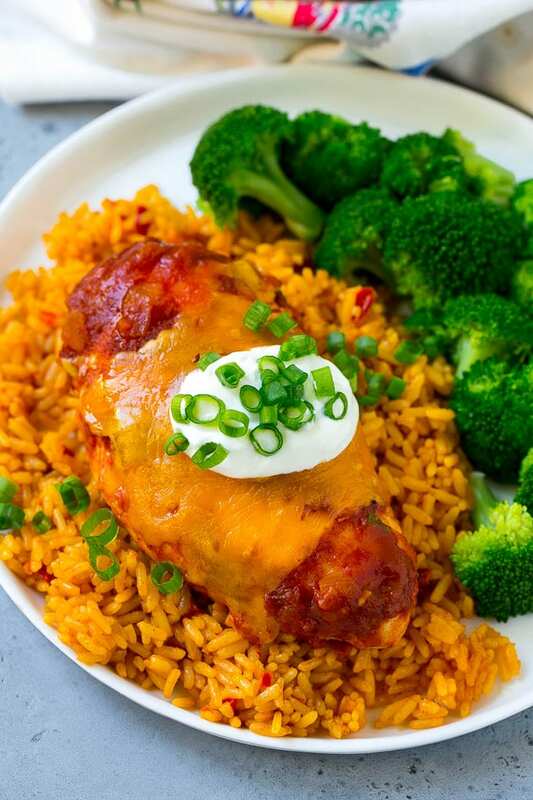 My kids adore lemon chicken and this super easy salsa chicken. You can serve this chicken over rice, or cut it up and wrap it in tortillas for burritos or fajitas. Sometimes I just need to get dinner on the table without a lot of fanfare, and this salsa chicken is the perfect solution. It literally takes 5 minutes to put together and everyone in my house likes Mexican food so this meal is always a big hit. How do you make salsa chicken? 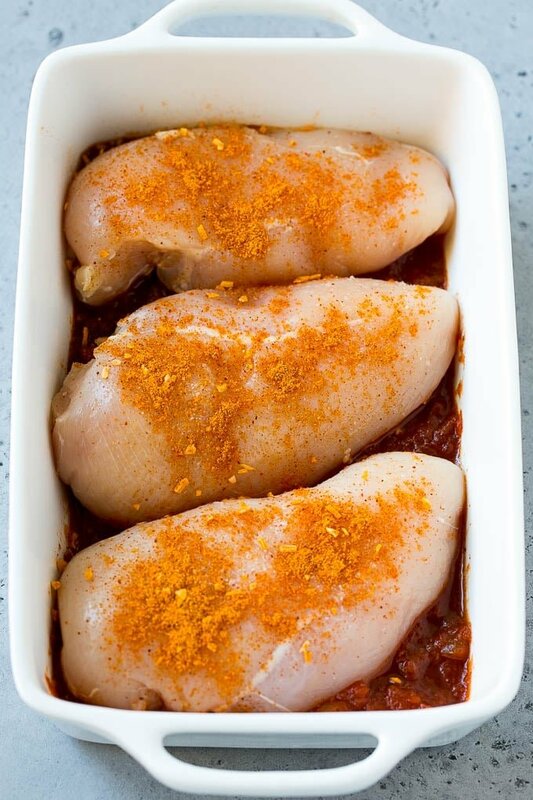 The first step is to grab some chicken breasts and place them in a baking pan with some salsa. The chicken breasts get sprinkled with taco seasoning, then topped with more salsa and baked. The finishing touch is some cheese, a dollop of sour cream and green onions. 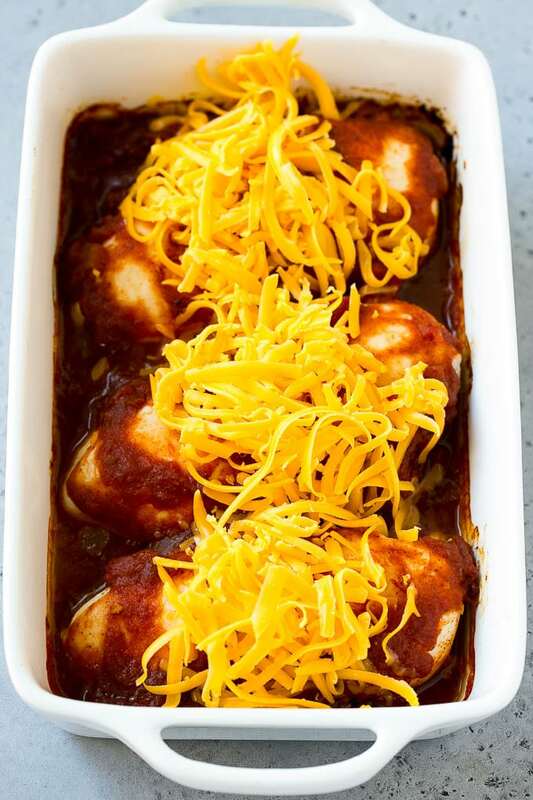 You can make this recipe with boneless skinless chicken breasts or boneless skinless chicken thighs. Try to choose chicken pieces that are about the same size and thickness so that they cook evenly. You can use any type of salsa you like. I typically use a mild red salsa. Other great options are green salsa, chipotle salsa, or even enchilada sauce. I typically top my salsa chicken with sour cream and green onions, but sometimes I add other toppings such as diced tomatoes, olives, tortillas strips or avocado. You can make this recipe a complete meal by adding some black beans and corn to the pan along with the salsa. What temperature do you bake chicken? I bake my chicken breasts at 375 degrees F. The chicken typically takes around 30 minutes to cook. If you’re not sure if your chicken is done, you can cut into it to make sure it’s not pink, or use a thermometer. A thermometer inserted into the thickest part of the chicken should read 165 degrees F when the chicken is done. You can serve this salsa chicken as is, or sometimes I cut the cooked chicken into strips and serve up a side of warm tortillas, rice, and beans for people to make tacos with. Regardless of how you serve it, it’s a healthy and easy dinner you can feel good about feeding to your family! Preheat the oven to 375 degrees F. Coat a 2 quart baking dish with cooking spray. Spread 1/2 cup of salsa in an even layer in the bottom of the dish. Place the chicken breasts on top. Sprinkle the taco seasoning evenly over the chicken. Pour the remaining salsa over the chicken. Bake for 30-35 minutes, or until chicken is cooked through. Remove the dish from the oven. Sprinkle the cheese over the chicken. Return the pan to the oven and bake for an additional 2-3 minutes or until cheese is melted. Top each chicken breast with a dollop of sour cream and sprinkling of green onions, then serve. Salsa can be made in advance and stored in the refrigerator for up to 8 hours before serving. This post was originally published on January 3, 2017 and was updated on January 20, 2019 with new content. 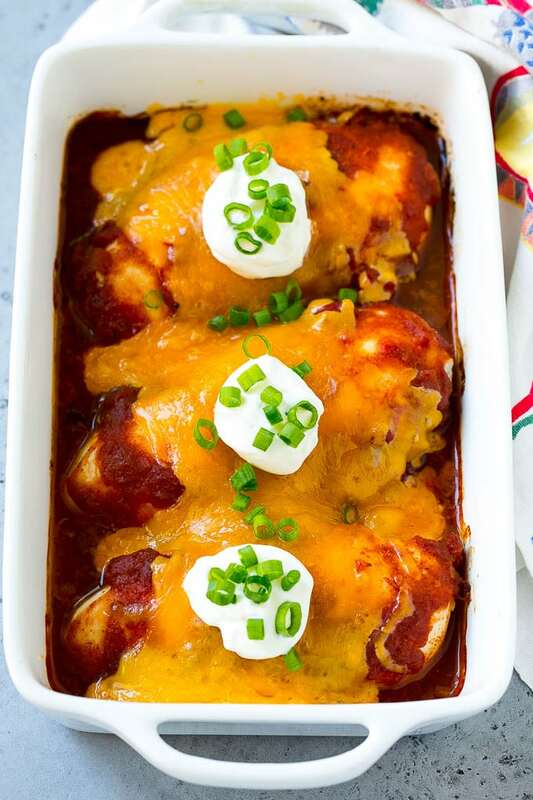 This Salsa Chicken looks so good! I love this. I need to try your recipe. And yes, I’ll add more cheese for sure! Such a great dish to try for the family. I know our boys love chicken and cheese. Definitely sounds like a hit. Salsa Chicken sounds yummy. I might switch up my “Taco Tuesdays” for this dish because technically – it has taco seasonings. Thank you for the recipe. Looks like a good presentation. If I still ate meat I would of tried this I am pescatarian now. 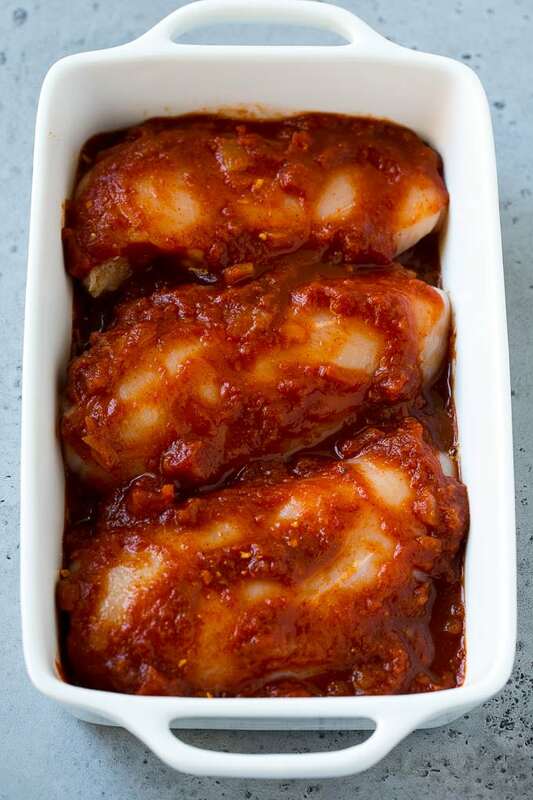 I love cooking chicken breast and this recipe you shared is something new so I am bookmarking this post! Thanks so much for sharing! 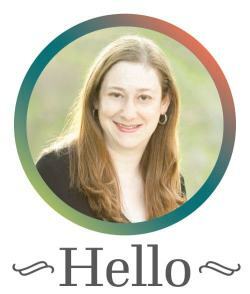 Hello Sara! Thank you for sharing your recipe. This dish has almost everything I like. I like chicken. I like cheese. I also like food when it’s baked! Definitely making this dish this week! I love Mexican food and top everything with fresh salsa, sour cream and guacamole! Yum, this dish looks beyond tasty! I love the avocado suggestion, and since our family always enjoys a touch of heat, I would use a medium salsa. Salsa and cheese is the best way to make anything better! I can’t wait to make this for my family. They’re going to love it. This chicken is super flavorful. I love having everything in one pan. I ate mine with corn tortillas. 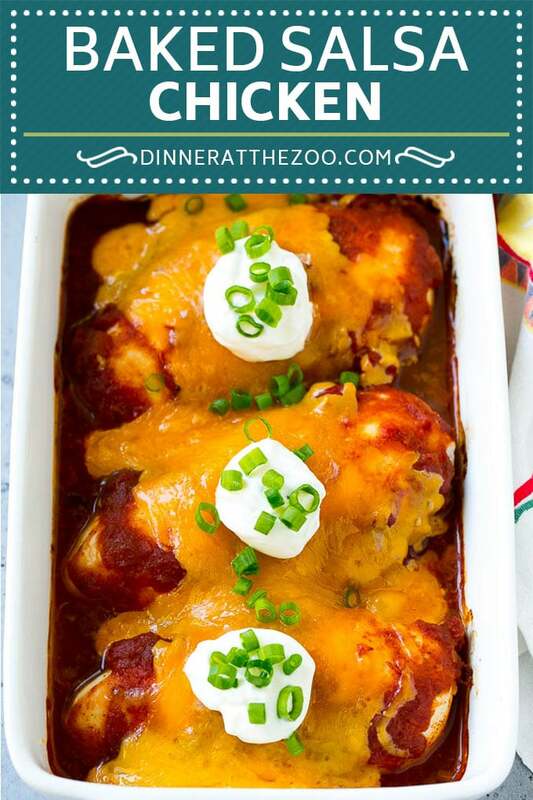 Love one pot meals and this salsa chicken looks delicious!